AMR, the parent of American Airlines, has raised $2.9bn (£1.8bn) of new financing to help it through the global downturn in air travel. The group said $1bn of the total came from advanced sales of air miles to Citigroup bank. A further $1.6bn came from a sale and leaseback arrangement with General Electric's aviation division for planes it had already ordered. 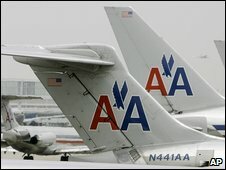 The airline also said it would add capacity at key US airports. Shares in AMR jumped 18% on the back of the news. Citigroup has effectively bought air miles in advance with which it can reward its customers when they use the bank's credit cards. "Today's announcement positions our company well to face today's industry challenges and allows us to remain focused on the future and on returning to profitability," said AMR chairman Gerard Arpey. He added a note of caution, however, saying that the airline "cannot borrow its way to prosperity". Reports also suggest that American Airlines is in discussions with Japan Airlines about taking a stake in the troubled Japanese carrier. "In one fell swoop, American Airlines has raised its game and put itself back in the thrust of gaining a competitive advantage against a backdrop of weak airline travel demand," said Saj Ahmad, airline analyst at the Gerson Lehrman Group. "The real question now is how long will we wait before we see them make a move on Japan Airlines - today's news is almost certainly a precursor to that."